With all those fancy cell phone cameras out there seamlessly piecing panoramas together right in their tiny-sensored innards, sometimes it’s easy to forget most of us lowly DSLR users still have to construct our panos together the old-fashioned way. Well, what passes as “old-fashioned” in this ever-changing software landscape anyway. When it comes to stitching panoramas together with photos from your DSLR, there are a lot of options out there, and now with Lightroom CC offering some basic pano stitching options it’s easier than ever to assemble multiple shots into a sweeping landscape. The budget conscious among you will appreciate a free program you may not be as familiar with that comes from a little known company out of Washington state. St. Stephen’s Episcopal Church – Wilkes-Barre, PA | The original pano is a 30 shot composite that is the equivalent of a 75 megapixel image. The Microsoft Corporation (I hope I’m spelling that right) has a freely available download called Image Composite Editor (or ICE for short) from their Computation Photography Group. If you’re familiar with panorama stitching programs it works in much the same way. 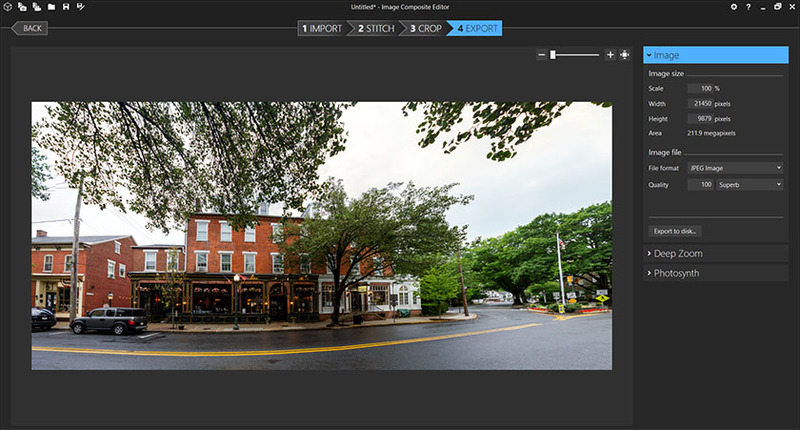 The software automatically combines multiple images from a single camera location to create a single high-resolution panoramic image. What I find that sets ICE apart is its ability to combine not just a single row of shots from left to right but multiple stacks of rows to create a super wide area of coverage from a single vantage point. Not to mention this task is performed in mere seconds. On my laptop this could take me a few minutes using other stitching software. 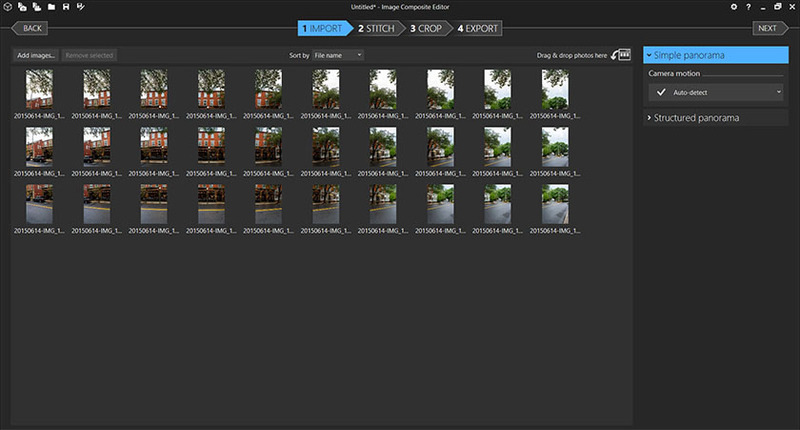 Other unique features include the ability to stitch RAW images, automatic exposure blending, and the its automatic image completion feature. 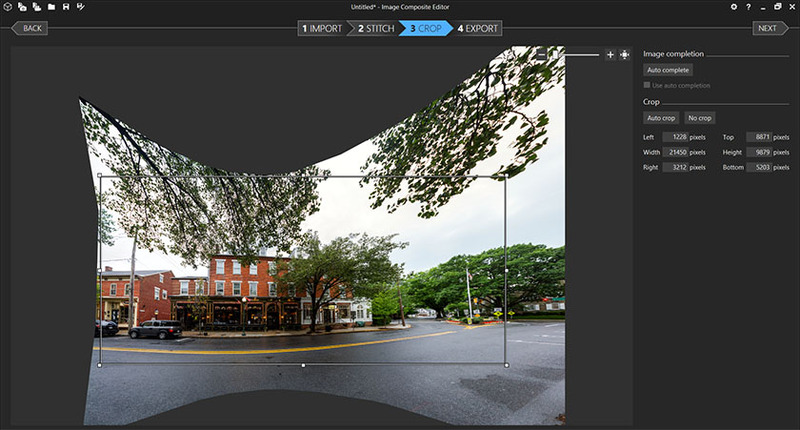 This feature will intelligently generate fill for the warped edges of a stitched panorama. I found this feature works fine with non-complex areas such as sky and grass, but struggles a bit more than the amazing content-aware fill feature in Photoshop does for more visually complex areas. Using the program has gotten easier over the years, and its current interface is super simple to navigate. The first thing I do when I’m going to use ICE is to adjust and export jpegs from the images I will be using in Lightroom. While ICE does have its automatic exposure adjustment to make the the tonality in the final image look as seamless as possible, I like to make other contrast, color, sharpness, and exposure tweaks to all the files before import. 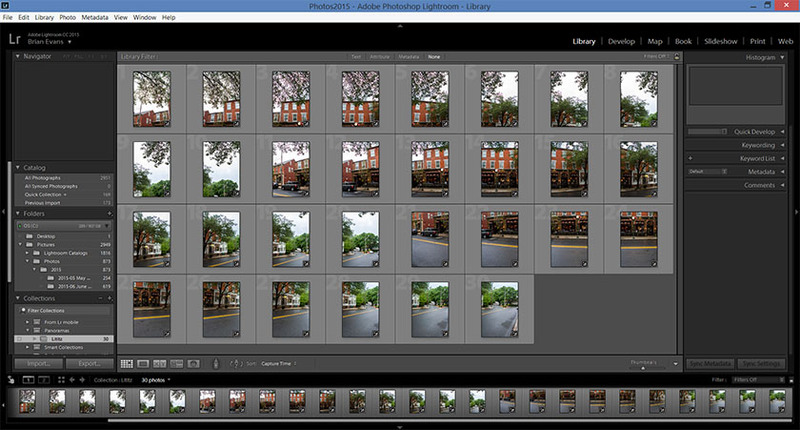 After I’ve exported my jpegs from Lightroom, I import them into ICE. 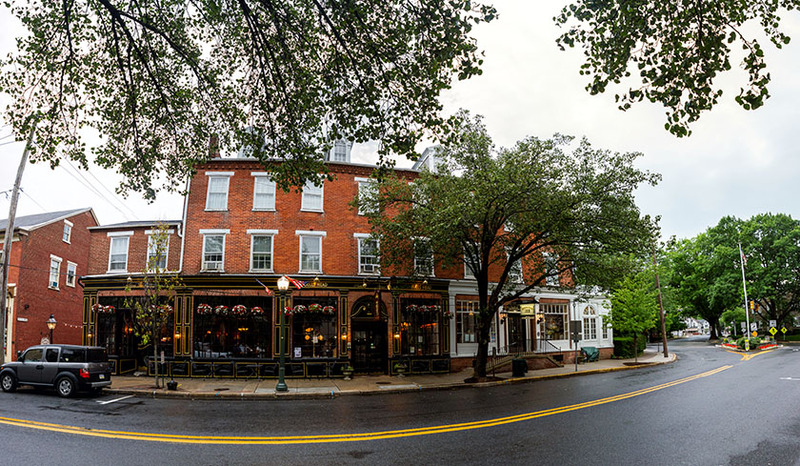 In this instance, it’s 30 images (3 rows of ten shots apiece) of one of my favorite spots in Lititz, the Bulls Head Public House. On import I generally set my settings on the left hand side to Simple Panorama and Camera Motion to Auto-detect. After import, ICE will give you a preview of the stitch, at which point you can choose the best projection option. I generally lean towards Perspective and Spherical. Perspective tends to flatten the interior of the photo to give your lines a straighter less exaggerated look. Spherical projection employs more of a bowed fisheye perspective. Different shots lend themselves to different projection types, so feel free to experiment with the ones you like best. Ice then allows you to choose where you want to crop your photo. Keep in mind when you’re shooting your images for the panorama that there tends to be excess trimmed along the extremes, so give yourself plenty of room on the sides and the top for cropping after the fact. This is also the point where you can include empty areas in your crop and give ICE a shot at filling in those areas with its Auto complete feature. Finally, ICE will process your shots and produce the final panorama. At this point you can export your file in a variety of sizes and file formats. I’ve been really pleased with the results I’ve gotten out of ICE. For simple one row panoramas, I still lean towards Photoshop’s panorama stitching abilities (probably more because of familiarity), but if you’re looking for an economical, easy-to-use, fast way to stitch together high-megapixel multi-row panoramas, Microsoft’s Image Composite Editor is a great choice. Bulls Head Public House – Lititz, PA | Projection set to Perspective. Original pano is effectively a 212 megapixel file. 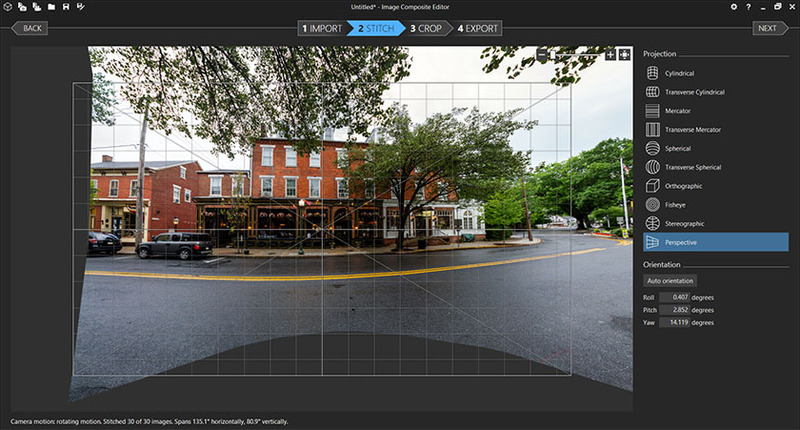 Bulls Head Public House – Lititz, PA | Projection set to Spherical. Original pano is effectively a 75 megapixel file. PPL Park – Chester, PA | Original pano is effectively a 54 megapixel file.